“Where do we come from?” My 5-year-old asks us that regularly, usually in the quiet time of a car ride. My wife answers by saying, “Great question.” And then, “Oh, look at the bright yellow school bus.” Crisis averted. If I’m asked, I’ll start talking about monkeys, throw out something about Tiktaalik and they will say, “Oh, Daddy you are so funny,” and then run away. Origin stories are a universal pastime. The question of where we come from resonates in many realms. The ultimate lies in our existence, and our lives are filled with searches for our ancestral origins, the story of how we met our lifelong companions, the stories of where we were born, stories of our cities and countries. Mythologies tell the story of us. They create a shared culture and a shared identity, around something that’s greater than ourselves, and begins to give focus to where we fit in the grand scheme, how we are part of a larger community. 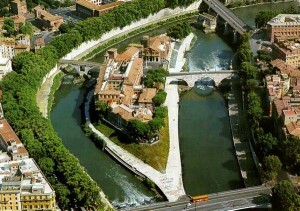 I am thinking all this while lying on the banks of the Tiber River. 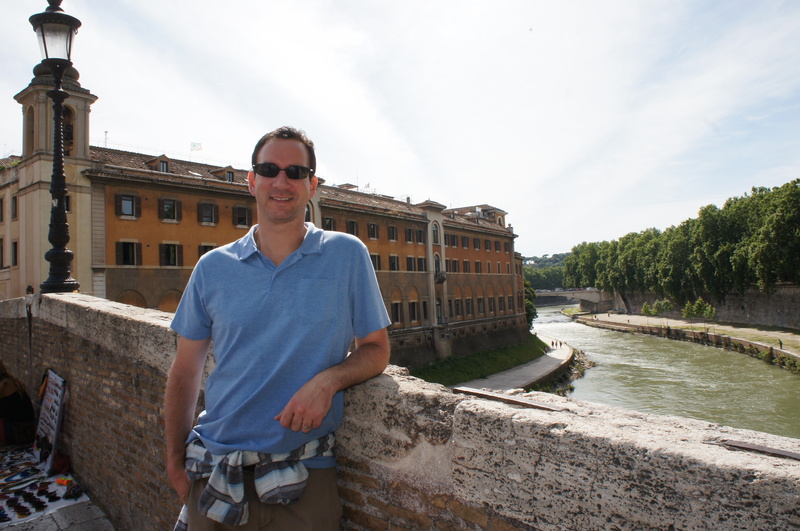 Currently, I am teaching and touring in Italy, savoring the wonderful food, exploring the origins of Western civilization. The nurturing she-wolf lurks throughout the city, reminding us of her origins, of the story of Romulus and Remus. Every corner reveals a new story, a new legend. So what’s our story? Where did we come from? At least, where was our first house, our first hospital? The word hospital originates from the Latin hospes, meaning guest or stranger. It’s the root of words such as hospice, hostel, hotel, and hospitality. The word patient comes from patior, which is to suffer. Hence a hospital can be interpreted etymologically as a place where strangers who suffer come to be cared for. To me, a hospital is a space focused on the healing, not simply the healer – the whole patient, and not just the disease. I would add that it is where the “community” in community hospital is as central as the individual. 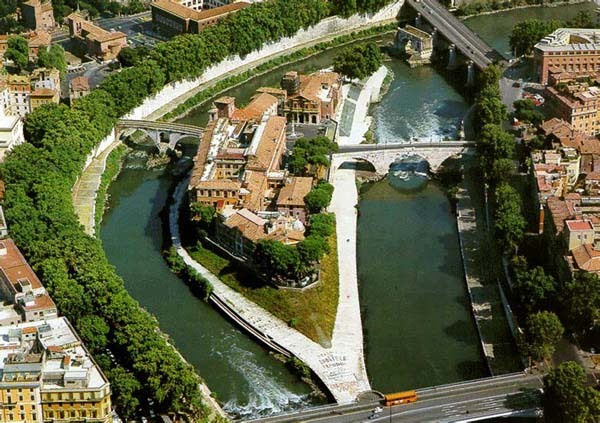 Tiber Island, Isola Tiberina was the site for one of the earliest Aesculapian Temples and the site of continuous medical care for over 2000 years. Many stories surround its own origin story. In 229 BCE, a sacred snake arriving on a ship from Rome slithered onto the island, signaling the place where the great temple was to be built. Aesculapius, known for his staff coiled with one snake, and his daughters Panacea and Hygea, were imbued with the art of healing. For centuries, his temples became a place where many sought refuge on their path to wellness. These temples were scattered throughout Ancient Rome and Greece, and used likely up until 600 AD. 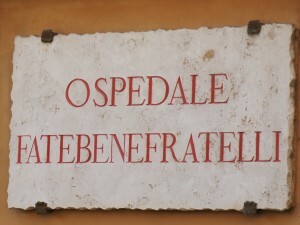 They were places of healing, operating as spiritual centers visited by the sick on pilgrimages of wellness. You would be greeted by priests in robes, with candles lit, sacrifices offered. Since you traveled for miles, you were sheltered and fed, and if well enough, enjoyed music nearby, theater, the salubrious air, and the springs. The priest helped prepare you for sleep, where the treatment for your illness would be revealed during your dreams. At the time, in the age of humoral medicine, it would be diet, exercise-heavy regimens, which would aid in balancing your state, and if followed correctly, cure your ailment. They were clearly precursor to spas, but were they the first hospitals? They may not resemble today’s monuments to healing, but they reflect to me a distant echo of today’s centers for healing. 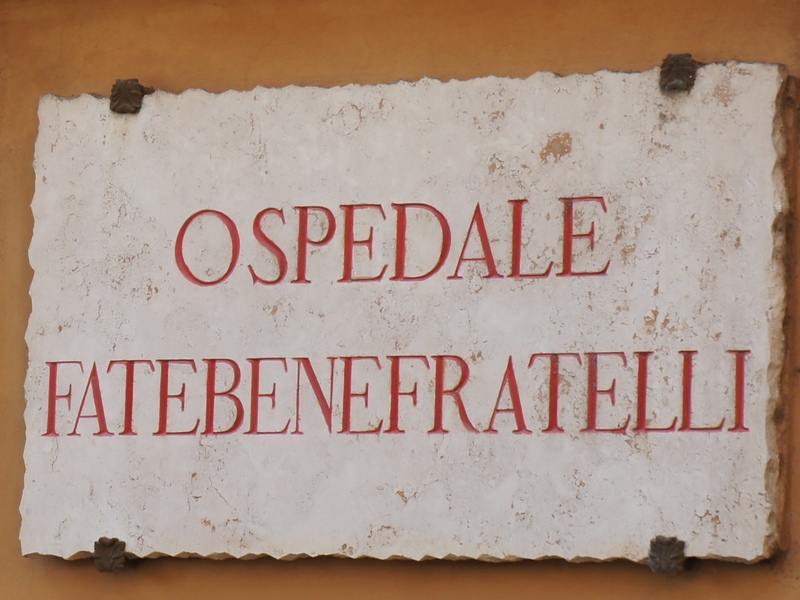 Walking on Tiber Island, we pass Fatebenefratelli, “Do Well Brothers,” a hospital descendant of the original temple. The sense of rest and compassionate care emanates the space as 2000 years of healing fill the air. This healing space reminds me of the need for this holistic and communal approach. Places where perhaps if our focus was on the patient, healing more than just the illness, but approaching the whole patient and placing them on a path that will not only heal the heart attack, but help prepare for smoking cessation, rehabilitation, and social support. In essence, defining what it means to be a community hospital. I enjoy walking on this journey in improving the hospital with my fellow hospitalists. Traveling the hallways with our patients and healthcare colleagues, knowing our history and our stories are intertwined. Our pride lies in understanding the building we work in every day, and the patients and healers who walked its wards. Our hospitals have their own unique stories, the healers and patients adding to the mythology every day. This story traces the origin of hospitals in general. Think of the origin stories of your institution, of your community and how that enabled us to stand in our hallowed healing halls today. 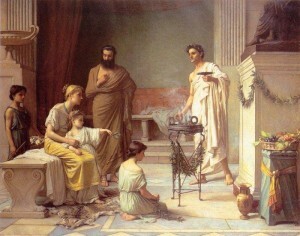 Don’t forget to honor Aesculapius for paving the way. Understnding the roots helps to better understand the substance. Great comments.